Brooklyn based Josephine Heilpern founded Recreation Center after graduating from Cooper Union. Her designs can't stop reminding me of 80's visuals with its grids, yellows and greys and wiggly patterns. This ceramic studio is the brainchild of Rachel Howe. Previously a Fine Artists, she plays with patterns, minimal colours and shapes. She created a range of dinnerware and planters. 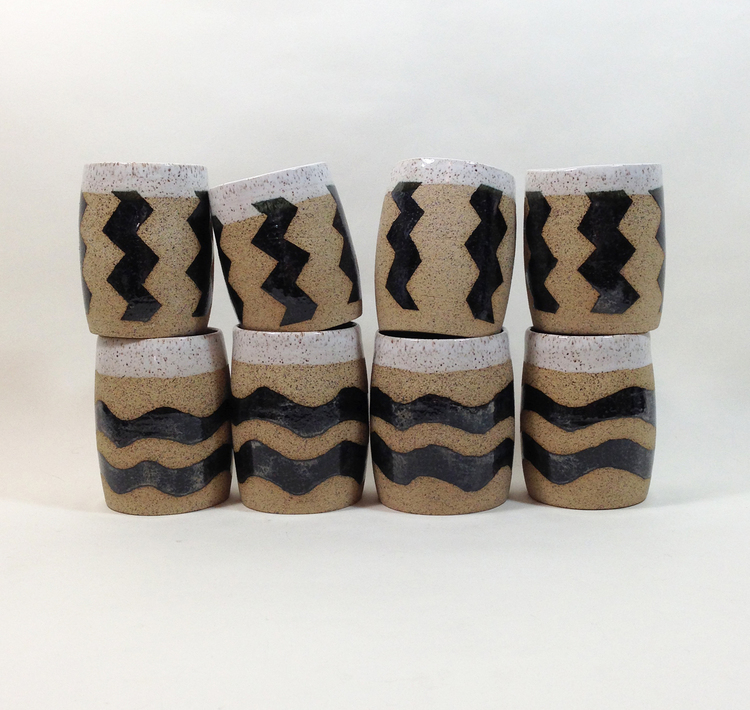 I am deeply in love with the mudcloth mugs. They'd go perfectly on my plywood kitchen shelves. Minimal, handmade yet stylish. Paper Clay Studio is an Etsy shop founded by Brittany McDaniels in 2012. Her ceramics are handmade and each piece is unique. Her work is modern and minimal, and heavily influenced by the classic designs of the Mid-Century. And what about you guys? Have you got a unique mug to proudly show off at the office or on your kitchen shelf?